of the 2013 ACBSP Outstanding Student Leadership Award. Prof. Michael Schirmer, Dr. Charlene Glenn, and Dr. Michael Bentil. We have many strong leaders among our Peirce students and alumni and recently, one of our outstanding Business graduates was recognized for these skills. Dessaree Johnson-Young, who just graduated with her bachelor's degree in Business Administration, has been named the recipient of the 2013 ACBSP Outstanding Student Leadership Award. This award is special because members of the College select their recipient and award a student who has illustrated strong leadership skills when interacting with peers, colleagues, and faculty. We selected Dessaree because she has demonstrated exemplary academic commitment and leadership over the past year. She served as chapter president of Delta Mu Delta and has done a great job representing the organization and Peirce. As chapter president, Dessaree assisted in leading the DMD Induction program, led the community service event (Walk Against Hunger), and supported the Business Division Conference held in April. She did all of this while working full time as a Collection Representative Supervisor for the City of Philadelphia and maintaining a 3.2 GPA. 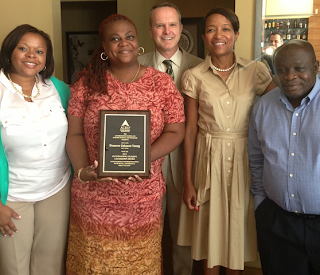 "I was very surprised to be awarded the ACBSP Outstanding Student Leadership Award. When I decided to run for Delta Mu Delta Kappa Nu President, I wanted an opportunity to display my managerial and leadership skills that I acquired here at Peirce. I have my award on display as a motivational reminder to me that I can do whatever I set my mind to do and to step out of my comfort zone. To be presented with this award is a testament to my academic and leadership growth. I will continue to build upon and use these skills as aspiration to pursue my graduate degree this fall." 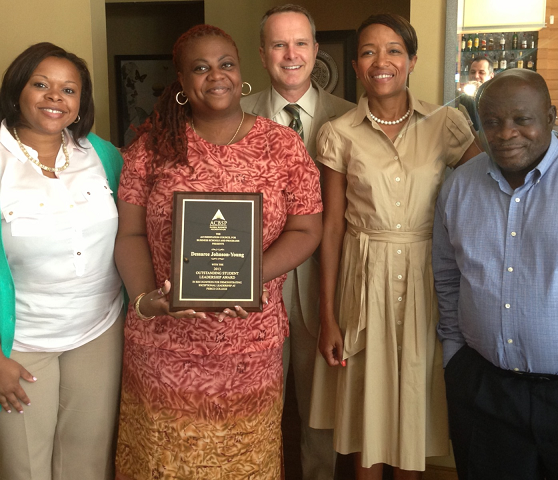 The award was presented to Dessaree during a luncheon with Dr. Rita Toliver-Roberts, Dr. Michael Bentil, Dr. Charlene Glenn, and myself. She was given a plaque to keep, and her name will be added to the ACBSP plaque that hangs here at the College. What an outstanding achievement Dessaree! Congratulations!